Leak-Tector is specially formulated for testing lines, cylinders, and systems carrying oxygen and other compressed gases for leaks. The formulation contains no oil, grease, fatty acids, ammonias, or any other ingredient that could combine with pure oxygen to form either a flammable or explosive mixture. Leak-Tector is simple to use. Apply the solution to a connection or surface suspected of leaking and watch for bubble clusters. Large leaks form large bubble clusters. Very fine leaks form white foam that builds up for several minutes, making detection easy and certain. Solution dries clean with no greasy residue and does not need to be removed after testing. Tests have shown that Leak-Tector clearly detects leaks as small as one pound of gas in 100 years, a leak rate of 1.16 x 10-4 cc/sec of nitrogen. 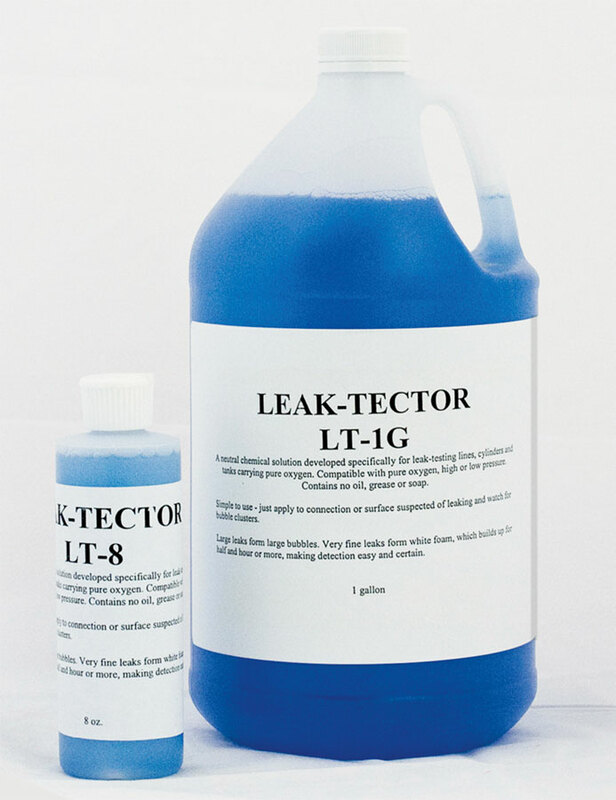 Leak-Tector is available in convenient 8 oz. squeeze bottles or 1 gallon containers.